The First Step of the organization centres in the parish. Each parish has a PMS Committee whose work is to coordinate all the PMS activities in the Parish. From there, it steps down to stations and wards where similar committees function, according to the need of each area. For the Holy Childhood, it moves into schools, giving every child the opportunity to participate in the school-based HCA. The Second Step is the Diocesan level. Here, it is headed by a diocesan director appointed by the diocesan Bishop. The Director works with a Council and may establish committees at the Zonal or Deanery levels for more effective animation and coordination. The Third Step is the provincial level. Each of the nine Ecclesiastical Provinces in Nigeria has a provincial PMS Council made up of the Diocesan Directors and a few others. At The National Level, it is headed by the National Director appointed by Rome on the recommendation of the Catholic Bishops Conference of Nigeria. He works with the PMS National Council made up of all the Diocesan Directors and Secretaries of the four arms of the PMS. In addition, each of the four arms of the PMS has a working committee headed by the secretary of that society. The Holy Childhood has the meeting of all diocesan coordinators which assists the Secretary and the Director in the planning and execution of the HCA programmes. The PMS work in close collaboration with the National Missionary Council of Nigeria, of the Department of Mission and Dialogue (CSN), Catholic Bishops Conference of Nigeria (CBCN). The Bishop Chairman of this Department is the “eye” of the CBCN at the PMS. At The International Level,the PMS is directly under the congregation of the evangelization of peoples,It is the congregation that appoints the National Director for each countryu.The National Director is a member of the Superior Council of the PMS which meets every year in the month of May in Rome. 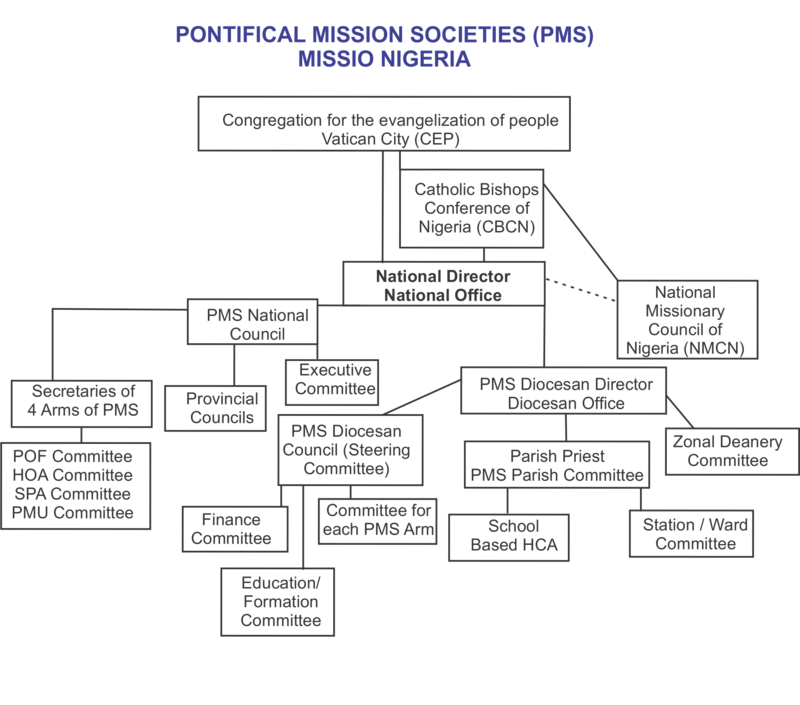 The exact date to which the birth of the Pontifical Mission Societies in Nigeria could be pinned is not known. But one can deduce that it started with the arrival of the early Missionaries in what is today known as Nigeria. It is common knowledge in the history of the Catholic Church in Nigeria that the Congregation for the Propagation of the Faith (Propaganda Fide), under which the four Pontifical Mission Societies function, was solidly behind the activities of the early missionaries in Nigeria. During those early years of evangelization, missionaries were sustained with funds coming from the Pontifical Mission Societies. However, these Societies were not distinctively known as such in Nigeria. With the setting up ofthe Catholic Bishops Conference of Nigeria and consequently, the Catholic Secretariat of Nigeria things began to take shape. Whosoever was made the Secretary General ofthe Secretariat, also handled the affairs of the Pontifical Mission Societies. The first National Director for the Pontifical Mission Societies in Nigeria was Msgr. John Ogbonna. He was appointed as he was ending his last tenure as the Secretary General of the Catholic Secretariat of Nigeria in 1985. Hhe tried to set up the first National Office of the PMS in Abuja. He arrived Abuja in October 1985 and was given a temporary accommodation at the National Missionary Seminary of St. Paul, Gwagwalada, Abuja Federal Capital Territory. From his first record of the Mission Sunday collections of 1985, 19 Dioceses remitted their contributions totalling N44,644.51k. From this humble beginning, by 1986, Msgr Ogbonna was able to get some Dioceses in Nigeria to appoint PMS Diocesan Directors with whom he worked. It was during his tenure as the National Director, that the dates for the celebration of the various arms of the Pontifical Mission Societies were selected and approved by the Catholic Bishops Conference of Nigeria. Pontifical Society for the Propagation of the Faith - the usual World Mission Sunday in October. Pontifical Society of St. Peter Apostle - the Good Shepherd Sunday which is the 4th Sunday of Easter. Pontifical Missionary Childhood, on Epiphany, though some Dioceses wanted it on the second Sunday of January. Pontifical Missionary Union of Clergy and Religious, June: Feast of the Sacred Heart of Jesus." The PMS in Nigeria has maintained these dates to this day except for the Holy Childhood which was moved to the Sunday nearest to 2nd February. In 1988, Msgr. Bernard Okodua was appointed to replace the Late Msgr. Joseph Ogbonna. He became the second PMS National Director in Nigeria. With the Catholic Secretariat still in Lagos, and Msgr. Okodua having major diocesan assignments, it became convenient for him to operate from his Diocese and residence in Lagos while maintaining a small PMS office at the Catholic Secretariat of Nigeria, there in Lagos. Msgr. Okodua kept to the tradition of holding two National meetings ofthe Diocesan Directors. The poor attendance of the Directors did not deter him from his resolve. Rather it spurred him to decide to go to each individual Diocese to meet the Priests and possibly the laity, to enlighten them on the importance of PMS. By the end of 1989, he had covered the Dioceses within Lagos Ecclesiastical Province and embarked on visiting Kaduna province. He had posters printed on PMS and sent to all the Dioceses along with a short essay on the PMS to educate the people. To raise funds for the PMS, he sent out appeal letters, which, however, did not yield much. Msgr. Okodua worked gallantly for the growth of the Pontifical Mission Societies in spite of difficulties that surrounded him for eleven good years when he finally handed over to Msgr. Hypolite A. Adigwe. As at then, the PMS National Secretariat was operating as a "One man Secretariat", from the one room office available at the Catholic Secretariat of Nigeria, Lagos. It was obvious that he could not run the National Office in Lagos from the Archdiocese of Onitsha where he was residing. Consequently, the Catholic Bishops Conference of Nigeria took a decision and communicated to him that at the time being his office would be located at Nnewi pending the movement of the National office to Abuja as the entire Catholic Secretariat was moving down to Abuja. For proper take off of the office at Nnewi, approval was given for a skeletal staff and the transfer of the most necessary documents from the Catholic Secretariat of Nigeria, Lagos to the PMS office at Nnewi. The first major task which the new Director had set before the National office at this stage was an increased awareness of the people of their responsibilities for the Missionary Aposto!ate of the Church. He urged Bishops to appoint PMS Diocesan Directors. He also encouraged the formation of PMS Provincial, Diocesan, Parish and Station Councils/Committees. In October 2000, the Pontifical Mission Societies in Nigeria participated very actively in the World Mission Congress held in Rome with a delegation 20 Diocesan Directors. By now, the dream of establishing a permanent home for the Pontifical Mission Societies in Nigeria was beginning to take shape in the mind ofMsgr. Adigwe. There were donations from Dioceses and Religious Institutes and individuals. At last the building was completed. The National Director with the entire Staff of the National Office moved down to Abuja. It was officially blessed in a special ceremony by the Papal Nuncio, Archbishop Renzo Fratini and officially opened by Archbishop Felix Alaba Job, President of the Catholic Bishop Conference of Nigeria on October 11, 2006, in the company of Most Rev. Dr. Hilary Odili Okeke of Nnewi Diocese who had hosted the National Office till then, Most Rev. Dr. Mathew Man-Oso Ndagoso, Bishop of Maiduguri and Bishop Chairman of the Department of Mission and Dialogue of the Catholic Secretariat of Nigeria, and all the PMS Diocesan Directors, many Religious and Lay People. Thousands of our HCA children "passing out" every year on reaching the age of 14.
publications of the National Office. Missionary Movements for Adults, Families and the Sick! Aged in the offing. Various formation courses for Missionary ad extra and ad intra.